The new CK Calvin Klein makeup line is actually the company's third attempt at launching a cosmetics brand. I was a big fan of the second line that was launched in 1999, especially its foundations which were my staple when I first started working. Their Double Satin lipsticks in Cognac, Maple, Burgundy and Pink Smoke were also my absolute favourites and perfect for every occasion. Hence, I was very sad to see the demise of that line. Well, perhaps third time will be the charm for CK? The new line has the same minimalist, clean aesthetic that is the trademark of Calvin Klein and the color range looks vibrant yet easily wearable without being boring or monotonous. The only thing that I really dislike is the ad campaign featuring a Goth-wannabe with the deathly pale skin, barely there brows, heavily-rimmed eyes and sullen expression. How in the world is that supposed to entice women to the makeup counters?! I mean, would the average woman seriously aspire to look like the model in the ad campaign? 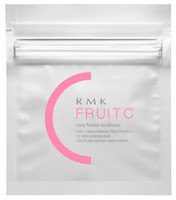 CK cosmetics is currently available in Japan, Hong Kong and Taiwan but has yet to launch in Singapore. It's also available on Sephora.com. Hopefully it'll make it to our shores soon! In the meantime, check out this video from AOL on the launch of the CK cosmetics line at the Spring/Summer '08 collection show. Allie is a suncare line made by Kanebo. I'm a loyal user of their sunscreens which usually come in SPF 50 and PA+++. The outstanding feature of their sunscreen lotions is that they have a watery lotion-like texture that dries down nicely to a non-greasy and non-sticky finish, unlike most other sunscreen lotions which tend to have a heavy cream texture. Check out the newly revamped Allie website here. Allie offers three sunscreen lotions to choose from. They contain hyaluronic acid and collagen for deep moisturising benefits and are unfragranced. The star feature of the new line-up is their "stress-free formula" which promises to be gentle on even the most sensitive skin. The sunscreens are all non-greasy and yet they help to keep skin moisturised as they contain hyaluronic acid molecules coated with silicone and "UV cut" micro-powders. Actress Kato Ai (formerly the face of Revue) is the new model for Allie. I'm totally loving her look in the new campaign, especially that gorgeous red dress. Quite a change from the usual hot bikini-clad babe in Japanese ad campaigns for sunscreens! Allie also has a makeup line that includes foundation, eye makeup and cleansers. If you're travelling to Japan, Allie can be found in virtually any drugstore. More details on Aube's Summer 08 collection which is set for release on 12 April. 3. Puffy Bounce Cheek: #84 Pink, #85 Orange, #86 Highlight (2940yen). Promo visual for the new Susie NY Spring '08 collection. Check out the new collection here. The Coffret D'Or website has been updated with the new base makeup range, including the new TV CMs featuring actresses Nakatani Miki and Shibasaki Kou. In case you're wondering what the two say in the CMs, Nakatani Miki says, "Starting.... the next me" and Shibasaki Kou says, "I like myself more." Check out the new base makeup line up here. Step 1: Brush the pale yellow shade in the upper right side of the Lunasol quad all over the lid. This will form the base for the gradational look. Step 2: Use the brush applicator to apply the white shade in the lower right side of the Lunasol quad over the area just under the arch of the brow. Highlighting this area helps to create a more textured finish. Step 3: Use the brown Kate eyeliner to draw a thick line along the lashline from the inner corner towards the outer corner of the upper eyelid. Step 4: Use the thin end of the sponge applicator to apply the brown shade in the Lunasol quad just above the liner in Step 3, also following the lashline. Step 5: Use the fat end of the sponge applicator to blend the green shade in the upper left of the Lunasol quad from the middle of the upper eyelid towards the outer corner. Step 6: Push up the inner corner of the eyelid with your finger and use the Coffret D'Or liquid liner to line the waterline, i.e. right along the lashline and in between the lashes. Step 7: Use the fat end of the sponge applicator to apply the white shade in the Lunasol quad under the inner corners of the eyes (to about 1/3 of the under-eye area). This helps to brighten up the eye area. Step 8: Use the fat end of the sponge applicator to apply the yellow shade from where the white shade in Step 7 ends, all the way to the outer corner of the under-eye area. Step 9: Use the Kate brown eyeliner to line the outer 2/3 of the lower lashline, i.e. starting from 1/3 of the lower lid (from the inner corner) to the outer corner. Step 10: Use the thin end of the sponge applicator to apply the brown shade in the Lunasol quad at the outer corners of the lower lid. Step 11: Push up the outer corner of the upper eyelid with your finger and use the Kate brown eyeliner to line the inner upper lashline, i.e. under the lashes. Step 12: Similarly, use the Kate eyeliner to line the inner lower lashline. Step 13: Apply the Clinique mascara, with special emphasis on adding volume at the base of the lashes for a more dramatic look. Step 14: Finally, hold the Clinique mascara applicator vertically to apply the mascara to each of the lower lashes individually. 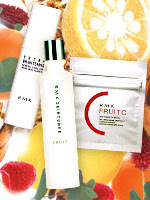 Joining the whitening skincare race, RMK will be launching a new fruits-themed skincare collection on 7 March in Japan. Pic of the new Canmake For Shine Eyes palettes (714yen) and nailpolishes (315yen) from 2Channel. The new nail polish shades are #91 Strawberry Syrup, #92 Orange Syrup and #93 Peach Syrup. The collection will be launched on 3 March. Biteki's April issue offers makeup and hair styling tips for creating the impression of a strong fearless lady. It also has a guide to all the new whitening skincare products being launched this season. Again, it doesn't look like the most exciting issue. A reader asked about how to subscribe to Japanese beauty magazines if one is outside of Japan. There are three possibilities, namely Japan Centre, which is based in the UK, Amazon Japan and Cdjapan.com. Ordering from such websites is pretty much the only option available to you if you live outside Japan as none of the Japanese magazines offer overseas subscriptions. All ship worldwide but the shipping charges are very expensive. For example, Cdjapan.com charges 3010yen for airmail shipping per magazine to Asia and Pacific countries and 3870yen for the US and Europe. It's cheaper for SAL, 1830yen for Asia/Pacific and 2230yen for US/Europe but that still means paying over US$20 for each magazine. If you're within the UK, a 6-month subscription to Voce through Japan Centre costs 41.12 pounds and a 1 year subscription costs 79.56 pounds. But if you're outside the UK, the delivery charge for one issue is easily around 13 pounds per issue. Amazon Japan is probably the cheapest option if you're ordering a few magazines as their shipping charges are based on a formula in which you pay a base charge plus 300yen per item. So if you're in an Asian country, the shipping charge for 1 magazine is 1900yen+300yen= 2200yen and for 2 magazines, it would be 1900yen+ (300yenx2)=2500yen. The base charge for US/Oceania (Australia/NZ)/South Asia is 2700yen and 3400yen for Europe. The April issue of Maquia features Japanese actress (and Coffret D'Or spokesmodel) Nakatani Miki on the cover, looking fresh-faced but smiling a tad unnaturally. Definitely not the best cover she has done. The theme of the issue is how to appear more feminine. Related to that are a couple of makeup tutorials featuring hot pink and ballet pink makeup themes. There is also an in-depth feature on eye makeup, including makeup tips for single-lidded ladies, reviews of the newest mascaras and eyeliners, the most outstanding eyeshadow palettes as chosen by 10 makeup artists. There is also the obligatory review of the new foundations hitting the market. All in all, it doesn't look like a very interesting issue. The theme of the April issue of Voce is base makeup with a comprehensive array of makeup tutorials focusing on application of foundations, concealers, highlighters etc to help achieve a flawless look. Here are some of the highlights. Cover girl actress (and Maquillage spokesmodel) Kuriyama Chiaki looking much more feminine and innocent than she usually does and without her trademark bangs. But that streak of foundation on her cheek for the cover photo looks absurd! Close-up pics of the new Gransenbon Gran de Eyes quads #20 Apricot Chai, #21 Lady Grace and #22 Mermaid Tiara. #20 and #21 look pretty! Pics of Love Clover's new Dual Eye Color N (1680yen), which will be launched on 6 March. New promo visual featuring the incomparable Angelina Jolie for Integrate's new Spring '08 makeup collection. Check out the new collection on the official website. I've been in love with Sarah Jessica Parker's Lovely fragrance ever since I received a sample vial of it. Its distinctive scent has a lovely, comforting warmth without being too sweet, headily floral or old-fashioned grandmotherly. It is innocence with a touch of sophisticated chic. The key notes are lavender, orchid and amber mingled with apple martini, paper whites and musk. I was all set to buy the Lovely coffret set (priced at $153 for the EDP, a body lotion and a couple of sample vials) at the Tangs sale only to find out that only the display set was left. The next day, I accompanied my mom to this small beauty and toiletries store, Li Hwa, in the corner of People's Park Complex in Chinatown. It's a tiny nondescript store on the 3rd floor that stocks all manner of toiletries, skincare, fragrances and beauty supplies, with significantly discounted prices compared to the big drugstore chains or department stores. There are several other similar beauty supply shops in the complex but Li Hwa is the one that we always frequent as the owner is a long-time family friend. I was surprised to see that they stocked the new Kate Moss fragrance (another current favourite of mine) and was selling it at only S$62 for the 100ml version. My brother had paid about $90 at the Heathrow Airport duty free. Imagine my even greater delight when I found that the Lovely EDP 100ml was selling for only S$55! The official retail price is US$65 (about S$90), according to the Nordstrom website. So, I'm now the proud owner of my own bottle of Lovely. Just seeing the elegant pink bottle on my dresser makes me smile and I can't stop sniffing my own wrists!